Ukraine is on the verge of ‘catastrophe’ according to former Soviet leader Mikhail Gorbachev, prompting President Viktor Yanukovich to call for an emergency session of parliament in the first sign that he and his government are ready to talk with protesters. While analysts say that this may be an indication that President Yanukovich is genuinely looking for a compromise, skeptics say that there is little Yanukovich can do to satisfy the protesters that is anything less of his resignation from office. The talks scheduled Thursday with opposition leader Vitaly Klitschko, a former heavyweight boxer-turned politician, and anti-government protesters has led to a temporary truce between the quarreling factions, set to expire at 8 p.m. Protesters say depending on the outcome of talks, the halt in political upheaval may be short lived. 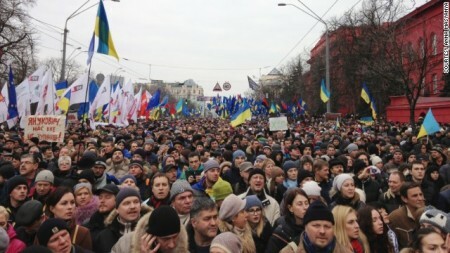 To make matters worse, Prime Minister Mykola Azarov has only inflamed protesters, saying that the protesters only want to overthrow the government, not work with it. He went on to say that there are supporters of a coup hiding “behind peaceful protesters,” and that they should make their intentions clear. The statement was broadcasted internationally as Azarov spoke at the World Economic Forum in Davos, Switzerland. Violent protests ripped through the country Sunday when “hard-core radicals” detached from the center of the protest area in the capital Kiev and began attacking riot police. Three people ended up losing their lives in the clashes, and over 150 police have been seriously injured. Despite such tumultuous events, the government has refused to declare a state of emergency. “We don’t see the need for tough and extreme measures at the moment,” said Azarov to Reuters. Observers say the reluctance to declare a state of emergency is the Ukraine government’s way of pretending that they have a control of the situation, although reporters on the ground say that this is not the reality. Thousands of protesters “stormed” the city of Rivne outside the capital, breaking down the doors of the regional administration headquarters. The protesters demanded that officials there release political protester detained during the protests. International leaders have weighed in on the situation, expressing reactions ranging from concern, to worry, to condemnation. German Chancellor Angela Merkel was one who condemned the Ukraine government’s crackdown on protesters, saying that the German government is “outraged” with the way Ukraine has implemented laws restraining freedom of speech and protest. French President Francois Hollande was one who expressed a concern with the situation, saying that the Ukraine government should “rapidly seek dialogue,” to put an end to the ongoing unrest. Protests began back in November of 2013 after laws were passed that restricted civil liberties, among them the right to peaceful assembly. Protesters are hoping that in the talks held Thursday they can address the anti-protest laws passed by parliament, a push which actually helped boost mass demonstrations in Kiev, with massive support behind repealing the laws.